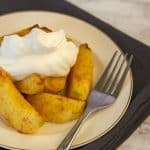 A simple, healthy, and sugar-free dessert featuring cinnamon baked apples with vanilla whipped cream. During Sugar-Free January I still craved dessert. On weeknights, I often sauteed a ripe banana, topped with some cinnamon and a dash of cream and called that “dessert.” But one weekend I wanted to make a special date night dinner for me and my husband while sticking with the sugar-free plan. I decided on simple, baked apple slices with some spices and whipped cream. The natural sweetness of the apple slices came out through the baking and the dessert really hit the spot! This is a super simple recipe. Just peel, core, and slice the apples. Then toss with some melted butter, cinnamon, ginger, cloves, and salt. Bake for 20 to 30 minutes at 425 degrees F. While the apples are baking, whip the cream with some vanilla extract. I enjoy plain, unsweetened whipped cream. If this isn’t you, feel free to add some maple syrup or Stevia to the whipped cream to sweeten it a bit. When the apples are done, let them cool for a few minutes and then serve with the whipped cream. Looking for more healthy recipes for Sugar-Free January? Try this Instant Pot Tortilla Soup, Vegetarian Swedish Meatballs, or Tofu Tikka Masala. 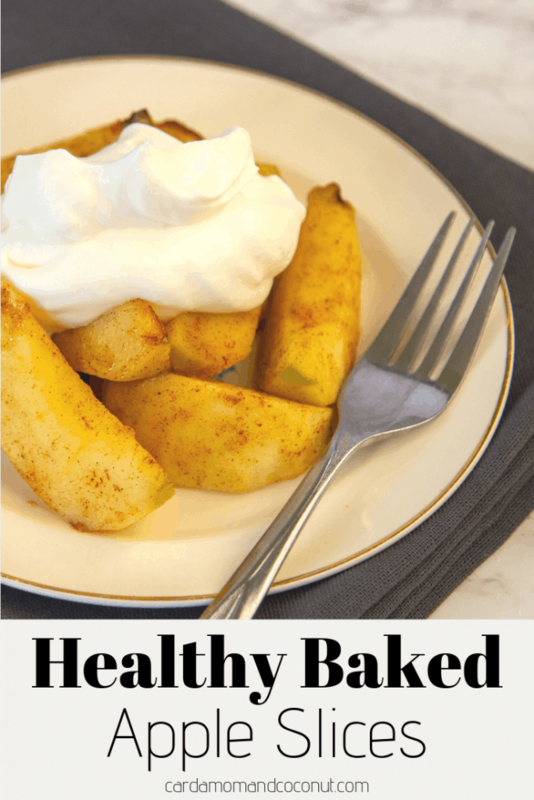 If you tried this recipe for Healthy Baked Apple Slices with Vanilla Whipped Cream, leave a review and a comment below! Peel, core, and slice the apples into 1/2 inch wedges. Melt the butter in a medium microwave-safe bowl. Add the cinnamon, ginger, cloves, and salt to the bowl and mix to combine. Add maple syrup or Stevia to the apple mixture if desired. 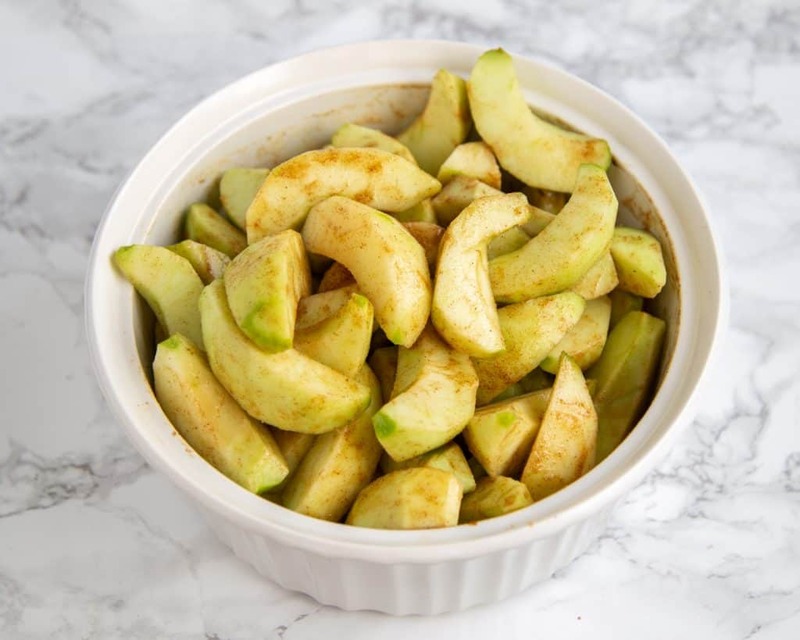 Toss the apples with the butter mixture and transfer to a baking dish. Roast the apples for about 20 to 30 minutes until they’re tender and bubbling. 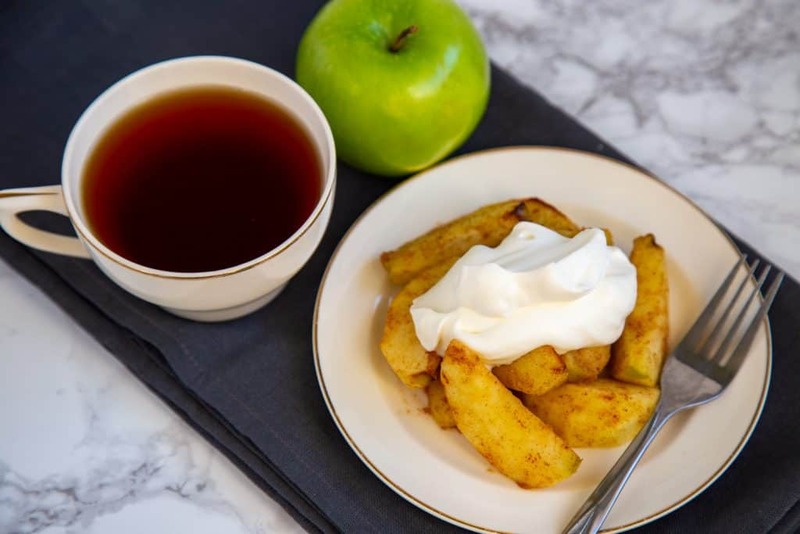 While the apples are cooking, whip the cream with the vanilla extract, adding the maple syrup or Stevia if desired. When the apples are done baking, let them cool for 5 minutes then serve with the whipped cream. This looks like a great option for when you want an apple pie fix without the pastry. Perfect dessert, so healthy and delish! I loved baked apples. Soft warm and delicious with the perfect topping yum! !